For the last three years, sixteen-year-old Lauren Whitt has been on an unimaginable journey. In February of 2011, what started as physical exhaustion and just generally feeling unwell, turned into violent episodes of abdominal pain. The 45-minute attacks started like clockwork once a day, then worked their way up to three times daily on a relatively predictable schedule of 9am, 12pm and 4pm. In the beginning, Lauren was seen by multiple hospitals and specialists that could not find anything medically wrong with her. Her mother Alicia, knowledgeable of medicine as well as being an herbalist and student of aromatherapy looked at how to help her daughter from both western and eastern schools of thought. Lauren eventually lost 25 pounds and was in such a weakened state that Alicia pleaded for help to a friend that is an anesthesiologist at Denver Health. Denver Health welcomed Lauren and her family with absolute compassion and understanding. They allowed them to stay and evaluated Lauren for five days. At the end, with no medical findings to point to, they determined that simply put, her Central Nervous System had somehow gone haywire. Alicia, determined to find a way to break the cycle of Lauren’s attacks, decided to try a suggestion from a friend, horse therapy. Barbara Wright at Harmony Horseworks allowed Lauren to come ride a little and be around the horses, but she was not strong enough to continue going after a while. 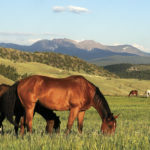 Finding enough strength to get back around the horses, they found Janine Nold, a trainer at Swede Gulch Farm who was close to their home and had a love for American Saddlebreds. Lauren started taking lessons with Janine a couple times a week as well as just grooming and being around the horses. The lessons had to be planned around the schedule of her episodes. At this point, Lauren had been out of school for four months and had not had any social interaction with other kids her age in a while. Even though Lauren was so thin and frail, she felt accepted by the other students in the barn and by the horses. Her abdominal episodes started to decrease as she continued to spend time with the horses. Lauren explains that her level of depression was so high and that, “horses were her big break point.” Her episodes gradually ceased completely. Her love for horses grew and unbeknownst to her parents, Lauren started searching the Internet for her dream horse, an American Saddlebred chestnut mare. For a couple of weeks she had been messaging the owner of a horse she found interesting in Littleton. She brought it up to her parents while on a family vacation. Shocked and upset that their thirteen year old had been shopping and communicating about the horse, they eventually agreed that they would look at her. They found Macy as an almost six year old, neglected and in a padlocked, filthy stall. Christina, the owner failed to show up but called and said they could ride her. They learned from the stable owner that Macy’s owner was very unstable. The other horse owners at the barn had been pitching in for her care. Janine had come along to see Macy as well and felt that it was safe for Lauren to go in with Macy and eventually they rode her. They could see that Macy had a good mind and she immediately took to Lauren. Lauren and her mom decided whether they kept her or not, they could not leave her in the conditions she was in. Janine understood their need to help Macy, but told them, “don’t expect anything”. 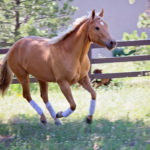 Best case, she may be able to show as an entry level Country Pleasure horse if they were very fortunate, she may only be a trail horse, or she may not be suitable for anything. When Janine went to pick her up, she called to tell Lauren and her family that she was concerned that Macy had foundered. They were devastated, but Lauren said, “I am not giving up on this horse. This was my chance to save somebody.” She felt that the doctors had given up on her, but she was not giving up on Macy. With the help of supplements that Alicia had researched that increase Nitric Oxide in the body and the body’s ability to help itself, Macy’s founder diagnosis was reversed (www.harmonyequinescience.com). As they tried to complete the purchase of Macy with legal help, they ran into multiple hurtles. It turned out that the owner had warrants out for her arrest, she had six different aliases and she had even sold Macy to another family in Illinois that thought she had been lost in an accident during transport. As they worked to get her ownership papers transferred with the American Saddlebred Horse Association (ASHA), the association just could not match up the signatures from the owner. Finally, Alicia met the President of ASHA at a show and was able to explain all that had happened and eventually get the papers straightened out. 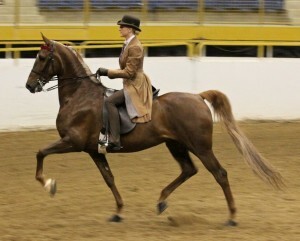 Now officially Macy’s owner, Lauren was set on showing Macy in the American Saddlebred Pleasure division classes. Trainers told her that Macy had no worth and she should give up before she wasted time and money on her, but Lauren tenaciously believed in Macy. Lauren spent countless hours preparing and training for showing Macy. Overtime, Janine saw potential in Macy. Once she hit the show ring, Lauren did not wear the typical black or gray show outfits the other riders wore, but the stand out, white jacket and pink vest. She believed so much in Macy and that she was truly a special horse, she couldn’t hide it. More than that, she wanted to show her in Park Pleasure with professional trainers and experienced riders as their competition. Show after show, Lauren and Macy were dead last. Her mom cried hidden tears for her and wanted to help her, but Lauren was determined and never failed to believe in her and Macy. She left every class with a smile and held tightly to her positive attitude. In order to move up to showing in other states, Lauren and her family decided to move Macy to Parker Valley Farm to be with top American Saddlebred trainer, Tom Volz. Lauren started taking lessons twice a week and Tom worked with Macy. Lauren and her family appreciated that Tom recognized Macy’s desire and willingness to do whatever she was asked. In 2013, Lauren and Macy showed throughout the year, including two trips out of state to Kansas City and Las Vegas up against some of the best competition they had seen to date and they did not come in last place! In fact, at the end of last year, Macy and Lauren were the Colorado State Champions in the Park Pleasure Division!!! 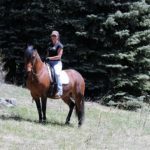 Lauren is in Parker at least three days a week riding two to four horses each time to prepare herself for the upcoming show season. Horses and ultimately Macy helped break the malfunctioning cycle of her Central Nervous System and draw her out of her depression. It is hard to know where Macy had been before Lauren found her or where she would be with out her, but Lauren and Macy certainly saved each other. Lauren plans to become a psychologist to use what she has been through to help others.